The densely forested island is sparsely inhabited, and is surrounded by numerous coral reefs, making it a popular scuba diving spot. There are also a lot of resorts and chalets around the island, which has duty free status. Apart from its diverse marine life, Tioman also has an inland rainforest area, encompassing approximately 12,383 hectares, which is a strictly enforced nature reserve. There are several protected species of mammals on the island, including the Binturong, Long-tailed Macaque, Slow Loris, Black Giant Squirrel, Red Giant Flying Squirrel, Mouse deer, Brush-tailed Porcupine, and Common Palm Civet, some of over 45 species of mammals and 138 species of birds, including the majestic Frigate bird. 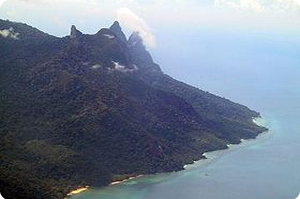 Moreover, Tioman has species that are endemic to its shores. The soft-shelled turtle and the Tioman walking catfish are both unique and can be seen on rainforest walks. The island is served by ferries from the Malaysian mainland, and a propeller plane service by Berjaya Air from Changi Airport in Singapore and Sultan Abdul Aziz Shah Airport in Subang, Selangor. 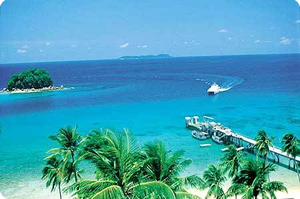 Tioman has been used for thousands of years by fishermen as an important navigation point and as a source of fresh water and wood. During the past thousand years, it has played host to Chinese, Arab, and European trading ships. Porcelain shards from this era of history can be found on beaches around the island.